The Bachelor of Science degree in Integrated Science and Technology produces graduates trained to effectively integrate scientific and technological factors with political, social, economic, and ethical considerations to solve complex, real-world problems that face society. 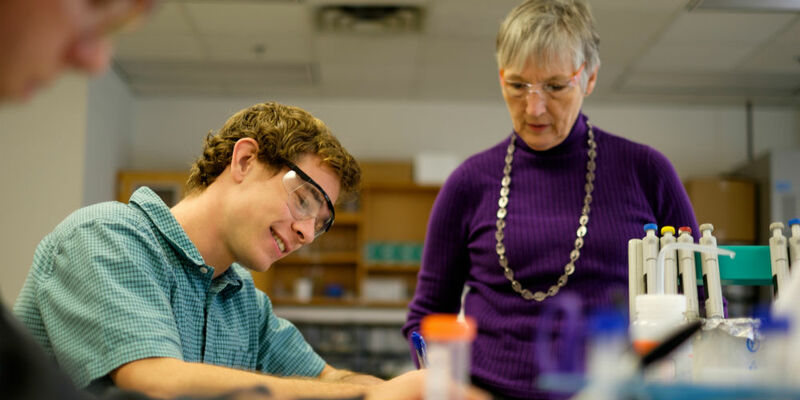 All students pursue a common program through their sophomore year that provides a foundation of science and an introduction to its technology applications. Studies are integrated and include mathematics, statistics, physics, chemistry, biology, knowledge-based systems, internet networking and security, environmental science, modern production, energy, and the role of science and technology in society. During their junior and senior years, all students pursue a deeper study of strategically significant areas that include applied biotechnology, energy, environmental studies, production systems, information and knowledge management, and telecommunications, networking, and security. Each student selects a concentration in any of these areas and pursues additional study in the concentration culminating in a senior project. Throughout the program, students work in teams extensively, frequently engage in hands-on laboratory and field experiences, progressively develop systems thinking tools for holistic problem solving, and utilize technologies as problem-solving tools. This sequence of five courses engages students in the practice of science, both to motivate and to provide an understanding of science and technology in the context of important current social issues. Current areas from which issues are selected are living systems, the environment, modern production, internet networking, and security and energy. This two-course sequence introduces the student to the broader issues encountered in science and technology problem-solving, particularly social, ethical, economic and legal issues. This sequence of five courses provides students with basic methods and tools for understanding and analyzing problems in science and technology. Subjects are taught in an integrated manner with applications as the unifying factor. Topics include calculus, elements of the physical sciences, statistics, project management, the computer, knowledge-based systems, and instrumentation and measurement. This four-course sequence integrates content from other BSISAT courses into a holistic problem-solving framework. In the first two courses (190 and 290), students learn and apply systems thinking methodology to investigate, define, and describe complex problems. In the second two courses (390 and 391), students practice the holistic problem-solving approaches to analyze and propose solutions for complex problem case studies that involve a mix of scientific, technological, and societal elements. The Holistic Problem-Solving Spine culminates in the Capstone Experience (discussed below), where students independently address a real-world complex problem. Students complete two strategic sectors of either 6 or 7 credits each. The strategic sectors, developed from national critical technologies lists, represent areas of current strategic importance in the world economy. The sectors are applied biotechnology, energy, environment, production systems, information/knowledge management and telecommunications, networking, and security. Students also have the option to tailor their area of concentration with the help and approval of their adviser. Working as part of a team of students and interdisciplinary faculty, students will propose, develop, manage, analyze and report on a project that addresses a real-world problem. ISAT 490 begins the sequence by helping students identify an appropriate problem to investigate and assemble the appropriate team. ISAT 491 then helps students write a complete proposal for the project. In ISAT 492 and 493, students complete the proposed work and prepare written and oral reports on the results of their work. Apply and integrate mathematics, physical science, biological science, and technology. Understand the professional requirements for the acquisition and use of information and data. Work effectively in multidisciplinary teams. Solve technological problems and understand their societal implications. Understand and apply the principles of professional ethics. Communicate effectively on social, scientific and technical matters. Analyze science and technology within broader global, political, economic and social contexts. Become autonomous, self-directed learners who recognize the need for lifelong learning. Use the computer as an effective problem-solving tool. Examine a problem and assemble the tools and knowledge needed to solve it.